S.W. Basics Body Scrub – A Must Have Exfoliator! If you’ve been looking for an exfoliator that’ll leave your skin feeling soft and looking beautiful, you’ll want to try S.W. Basics Body Scrub ($22). This is my absolute favorite way to exfoliate my face and skin. 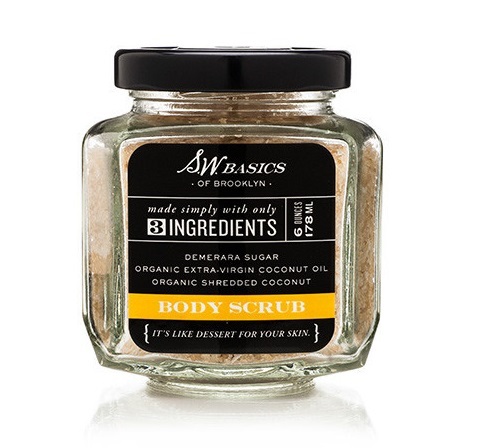 In the past, the exfoliators that I used were harsh, and not only were they rough on my face, but they also didn’t leave my skin feeling as soft and smooth as this body scrub from S.W. Basics of Brooklyn. As an added bonus, this body scrub smells amazing! The only ingredients used in the scrub are organic demerara sugar, organic shredded coconut, and organic coconut oil. The sugar and shredded coconut act like an exfoliator, while the organic coconut oil works as a moisturizer. With the holidays upon us, if you have any friends, family, co-workers, or neighbors who you still need to buy a gift for, I would definitely recommend this body scrub. You’ll want to pick one up for yourself, too, as I know you’ll love this exfoliator as much as I do. You can use it in the shower on your entire body, or just on your face – either way, you’ll have silky smooth skin in no time. This is a great way to complement the other wonderful things that you are doing for your skin by eating lots of fruits and vegetables, and nourishing yourself with organic food and lots of water. I love that this scrub is gentle, but effective and does not contain any harmful ingredients. I can’t wait for you to try it and enjoy it as much as I do! Blogger and journalist Esther Honig has shown, once again, that the standards of beauty vary across cultures, and around the world. 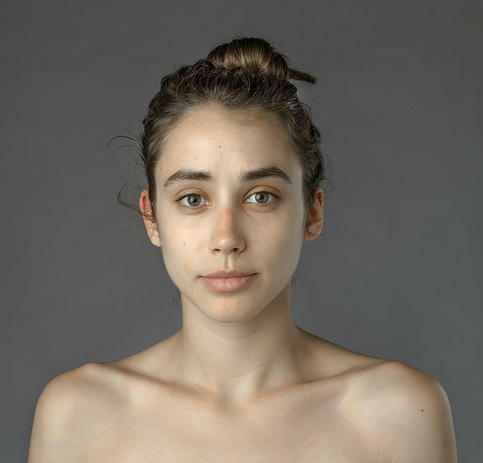 In her project, “Before and After,” she worked with 40 people from 25 different countries and asked them to take an unaltered photo of her and make her beautiful. She has shared some of the resulting images, which are a reminder of how beauty is defined differently around the globe. This project reminds of Jessica Simpson’s The Price of Beauty, in which she traveled to different parts of the world to explore what people consider to be beautiful. In The Price of Beauty, Jessica Simpson traveled to France, where she met Isabelle Caro, a model who shares her heartbreaking struggle with anorexia. (Isabelle passed away on November 17, 2010, at the age of 28, after struggling with anorexia since the age of 13.) Jessica also traveled to Uganda, where being overweight and even obese is considered to be beautiful. Women are often sent to fattening huts before their weddings, where they are forced to drink milk and ghee (clarified butter) to gain unhealthy amounts of weight. This is very different from the standards of beauty that we have in the US, where most people (especially women) are striving to reach an unattainable level of thinness (remember, it’s about being healthy, not thin!). When she visits Thailand, Jessica learns that white skin is considered beautiful, and many women will go to extreme lengths to whiten their skin. One woman disfigured herself when she bleached her skin. In the US, most people consider tan skin to be beautiful (just take a look at all of our tanning salons and orange celebrities), so this was another beauty ideal that differs from what we see in America. I actually got teased by my cousins when I was growing up, because I have fair skin and they are all tan. I was constantly told that I needed to tan, so it took me some time to embrace my white skin. And now I won’t even consider tanning – natural is best! I’m always struck by the different ideals that people around the world have of what it means to be beautiful. True beauty, of course, lies within. Within Honig’s project, it’s interesting to see how some countries chose to stick with a more natural look, while others used of lots Photoshopping to give her darker eyebrows, makeup, extended eyelashes, and different facial features. What strikes you most about the Photoshopped images and Esther’s project? *All photos courtesy of Esther Honig. *I do not own the videos that I link to in this post.